This was our first Rangers-Devils game in-person since this happened. We attended the Rangers-Devils game as a family Saturday night. 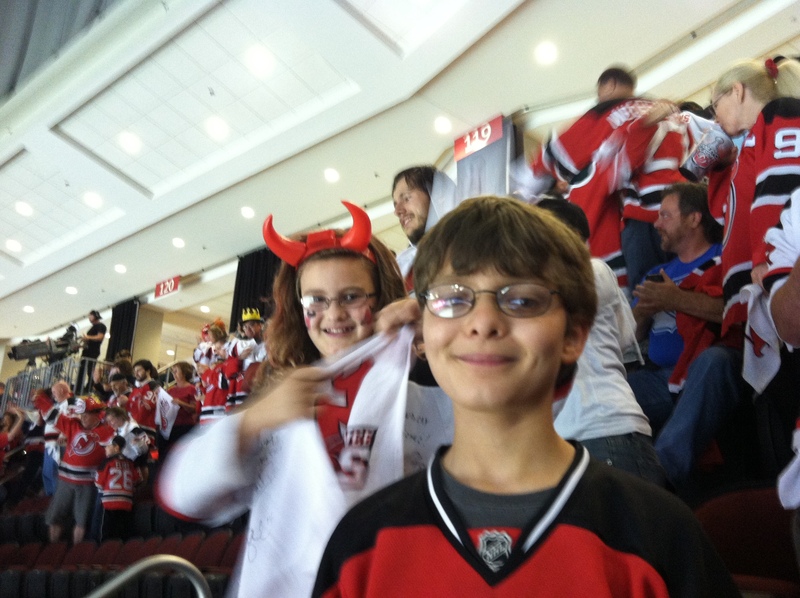 We had a wonderful time as the Devils shut out their arch-rivals to earn their first win of the year. We cheered and shouted. We sang “HENNNNNNNNNNN-RIIIIIIIIK” at the Rangers goalie. We waved to all the Rangers fans that left early. We generally had a grand time. But besides the family togetherness that is the main reason we go to games, there were two moments that stood out for me. One was watching Ryan actively seek nearby fans to exchange high-fives after each New Jersey goal. This is a habit he has picked up after years of attending sporting events. It was especially evident at our recent trip to Penn State. For me, it emphasizes the essentially social nature of live sports, and I am thrilled to see Ryan take part. The second noteworthy occurrence was more subtle, but just as important. I usually sit next to Ryan at the games, and try to engage him in bits of hockey strategy that might help him as a hockey player. The first New Jersey goal came on a rebound shot. I wanted to make sure Ryan noticed. “Ryan, did you see how the Devils got that goal?” I asked. His reaction caught me off guard. “They did what I do,” he answered. Indeed. The goal came about because a player without the puck had gone to the net with his stick down, putting himself in the right place at the right time to bury a rebound. It was the exact strategy Ryan used to score five goals last year despite not possessing great individual skill or a strong shot. It may not sound like much, but to me it was huge. Ryan observed a real-world situation, digested the key information, AND put it in context of his own experiences. In the past, he might have done those things individually, but would need prompting to put it in context and understand how the observation applied to him. It’s the difference between being conversant In a foreign language and being able to translate a document written in that language. 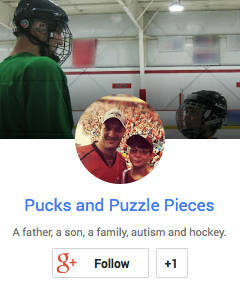 Of course it helps that the subject — hockey — is the thing that Ryan is most interested in, but to me this is still a milestone. It represents his growing engagement in the word around him and a more integrated view of how he fits into it.